"Wonderful Buffalo-style fried chicken wings!" Season chicken wings lightly with seasoned salt. Mix flour, salt, black pepper, cayenne pepper, and paprika together in a wide, shallow bowl. Press wings into flour mixture to coat and arrange onto a large plate so they do not touch. Refrigerate coated wings for 15 to 30 minutes. Dredge wings again in flour mixture and return to the plate. Refrigerate wings again 15 to 30 minutes. Fry chicken wings in hot oil until crisp and no longer pink at the bone and the juices run clear, 9 to 12 minutes. An instant-read thermometer inserted into the thickest part of the meat, near the bone should read 165 degrees F (74 degrees C). Transfer fried wings to a large stainless steel bowl. Drizzle sauce over the wings and toss to coat. 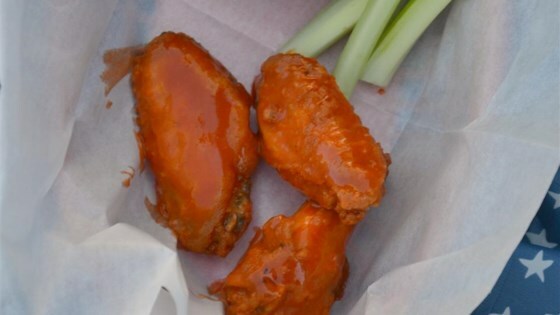 Watch a Buffalo native reveal his secret recipe for authentic chicken wings. The nutrition data for this recipe includes the full amount of breading and sauce. The actual amount of the breading and sauce consumed will vary. These are the best fried chicken wings I've ever made! A little extra work but well worth the effort, they turned out great! Thanks for sharing this recipe! This was a great recipe. I used Moore's Buffalo Sauce for my wings. I diluted it with 2 tablespoons melted butter to 1 cup of sauce.